Serena Williams will grace the cover of Vogue's April issue. This will be the second time the tennis star has appeared on the fashion mag's cover, but the first time she is photographed alone. The profile delves into her friendship with Caroline Wozniacki (the two are very close despite competing against one another), and her approach to the game. "On the court, I am fierce! I am mean and I am tough. I am completely opposite off the court. My confidence just isn't the same. I wish I was more like I am on the court. Nobody would know that I am constantly crying or complaining," she told Vogue. The cover announcement coincides with Williams' decision to exit the Indian Wells tournament due to a knee injury. 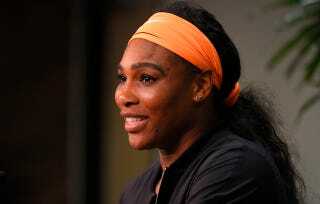 In 2001 the highest ranked female player was booed for withdrawing from the same tournament. According to the New York Times, Williams boycotted Indian Wells for 13 years. But you already know she looks stunning. Ups to Vogue for this one.